The NWS SPC has updated its tornado outlook (valid until 6am). The 5% (brown) area is the significant threshold with an enhanced -- 10% -- probability area. These probabilities seem low but they are actually relatively high, especially for this time of year. The hatching indicates where violent tornadoes may occur. 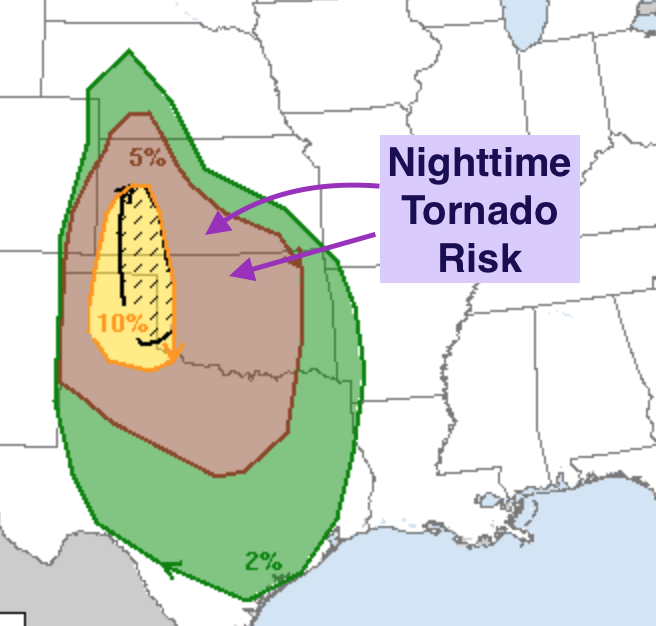 It looks like there is a significant chance (my opinion) of nighttime tornadoes extending into south central Kansas and north central Oklahoma. Finally, a couple of the models are bringing strong thunderstorms into the DFW Metroplex during the late evening.